We offer complete histology solutions on any tissue in animal models or human samples. 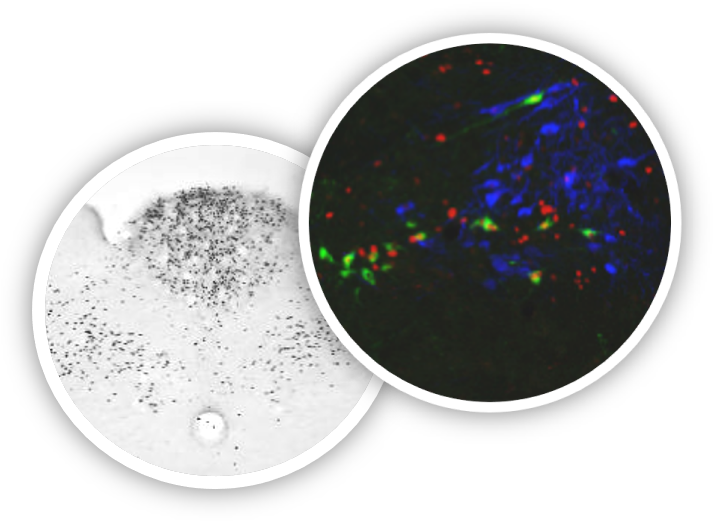 Our expertise allows us to provide custom-made solutions to your needs – either using tissue from your experiments or tissue from in vivo studies performed at Gubra. By taking advantage of our extensive experience with stereology and histological analyses, you can substantially improve the quality of your study endpoints. We provide you with both qualitative and quantitative data involving clear histological images as well as relevant graphs and statistic, on which you can base solid decisions progressing your project. C-Fos is a marker of neuronal activation and can be used to assess direct compound induced activitaion or activated neuronal pathways. In combination with fluorescent immunohistochemistry we can identified the phenotype of activated neurons (here demonstrated by GLP-1, TH and cFos IHC in the NTS). See our movie for efficient sampling protocol for unbiased assessment of beta cell mass. 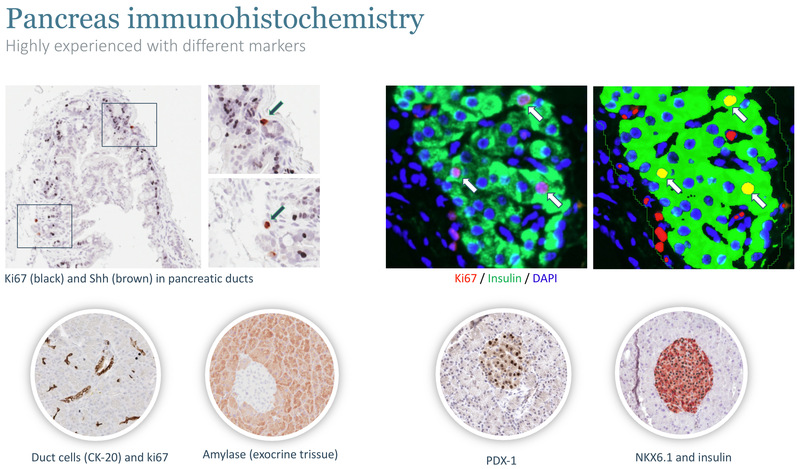 Stereological assessment of the pancreas using a panel of different immunohistochemical markers – ranging from endocrine cell dynamics to changes in exocrine acinar and ductal compartments. See our movie about how Laser capture microdissection (LCM) enables you to fish out specific cells from heterogeneous organs and gives you a level of precision not possible with manual extraction methods. Gut histology provides novel information about gut plasticity and endocrine changes in different animal models and following surgical interventions. Stereology is an approach to quantitative histology, which ensures rigorous quantitative analysis of the size, shape, and number of objects. It is designed to extract quantitative information about a 3D structure, based on measurements on 2D-cut sections. Stereology plays an important role in validating your research as it produces unbiased, efficient, and more reliable than other ad hoc quantitative analyses. Stereology is a set of geometrically and statistically founded methods designed to extract quantitative information about a 3D structure, based on measurements on 2D-cut sections. Conventional methods usually involve assumptions about the size, shape and distribution of cells in the organ. Such assumptions are seldom true, and may lead to systematic deviations that cannot be corrected. In contrast to these conventional methods, stereology utilizes systematic, uniform, random sampling to provide unbiased, quantitative data on a number of areas, including the volume, area, numbers, length and size of an organ.